Congratulations to Brittany and Carrot for a safe return home. 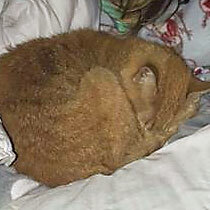 Carrot a five year old indoor kitty went missing on November 28. K9 Riley showed that Carrot was indeed still right at the house but in the sewer. As the action plan was followed and Brittany’s husband went to the sewer to see if Carrot was still there, Brittany opened up the front door and Carrot was sitting right there, meowing!